The election of Donald Trump as President of the United States has reignited a key debate about American immigration policy. Do illegal aliens commit crimes at a higher rate than native-born U.S. citizens and lawful immigrants? And, if so, how should that influence any pro- posed changes to our immigration system? Advocates of open borders are fond of claiming that illegal aliens commit fewer crimes than native-born U.S. citizens. That makes perfect sense, they assert, because illegal aliens do not wish to be brought to the attention of law enforcement and risk deportation from the United States. In reality, however, this is a weak argument. Since the implementation of the 1965 version of the Immigration and Nationality Act, the enforcement of our immigration laws has been comparatively feeble. And the emergence of the “sanctuary city” movement in the 1980s meant that state and local police in many jurisdictions refused to cooperate with federal immigration authorities. As a result, for many decades, only those illegal aliens with particularly serious criminal convictions had any real fear of deportation. Nevertheless, despite evidence to the contrary, open-borders advocates have persisted in their claims that fear of deportation means illegal aliens are inherently pre-disposed to avoiding criminal behavior. (This argument conveniently ignores the fact that improper entry by an alien is, in and of itself, a federal crime). Are these assertions legitimate? Hard data indicate that they are not. Research conducted by the Federation for American Immigration Reform (FAIR) strongly suggests all claims that illegal aliens commit crimes at a lower rate than native-born U.S. citizens, or lawfully-present immigrants, are a myth. In fact, this report finds that in the states examined, illegal aliens are incarcerated up to five and a half times as frequently as citizens and legal immigrants. As noted above, for decades, open-borders proponents have parroted the same narrative: “Illegal aliens commit less crime than native-born citizens.” However, this claim typically rests on studies that manipulate data in order to support the fictitious “illegal aliens = less crime” narrative. Why are the majority of studies of illegal alien criminality so flawed? First, as Peter Kirsanow, of National Review notes, “Illegal-immigrant crime calculations conveniently and invariably steal a base by leaving out the millions of crimes committed by illegal immigrants related to procuring fraudulent social security numbers, obtaining false drivers’ licenses, using fraudulent green cards, and improperly accessing public benefits.” That error is then compounded when researchers intentionally elect to leave out broad classes of crimes for example, drug offenses — as the Cato Institute frequently does. Secondly, most federal, state and local government agencies do not collect data on the rates at which illegal aliens are convicted of crimes. Most likely, this is due to political correctness, and a desire to keep the truth about the number of crimes committed by illegal aliens from coming to light. Peter Kirsanow is one of the few who has commented openly on this tendency. He states, “Unfortunately, almost every public official not named Jeff Sessions guards against disclosure of illegal-immigrant crime data more tenaciously than disclosure of nuclear launch codes.” Regardless of why this information is not collected, the end result is that there are a limited number of sources for obtaining data on crimes committed by known illegal aliens. Finally, most researchers tend to ignore the few established sources that provide data on criminal acts by known illegal aliens. They point to all types of alleged, and typically baseless, “flaws” in this data, ranging from “limited sample size” to an inability to determine whether illegal aliens are being counted more than once. In actuality, however, the only real flaw, from the perspective of mainstream research organizations, is that examinations of data on criminal activity by known illegal aliens tend to establish that those who enter the U.S. in violation of our immigration laws also commit other crimes at a higher rate. This should not be surprising to anyone. The simple fact that illegal aliens violated American immigration laws – and must continuously violate other federal, state and local laws in order to mask their ongoing illegal presence in this country – demonstrates a blatant lack of respect for the rule of law. We analyzed incarceration data from the federal government’s State Criminal Alien Assistance Program (SCAAP) and compared it to the public records of state and local prisons. Via SCAAP, state entities apply to U.S. Immigration and Customs Enforcement (ICE) to obtain reimbursement for the costs associated with incarcerating illegal aliens. Accordingly, the rate at which a state seeks reimbursement provides a good snapshot of the number of illegal aliens in its criminal justice system. 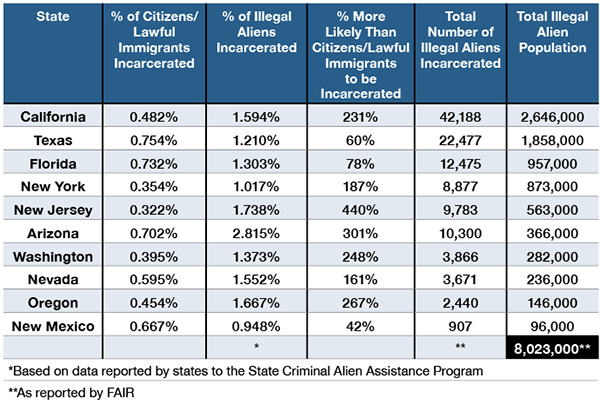 In order to estimate how many illegal aliens are currently incarcerated in a given state, we relied on data from the most recent SCAAP report published by the Department of Justice’s (DOJ) Bureau of Justice Assistance (BJA). Our other calculations are based on commonly available state corrections/criminal justice reports and other non-SCAPP federal data. The majority of the illegal population in the United States lives within these states. Individually, they all have significant, dense illegal alien populations. They consistently report to SCAAP, and therefore have the most reliable and complete data. The majority of the population in these states lives within a SCAAP-reporting district. There is little to suggest that our conclusions would be significantly different were we somehow able to obtain valid data for those jurisdictions that either do not participate in SCAAP or that do not produce enough SCAAP data to reliably estimate their total numbers of incarcerated illegal aliens. Taken together, these ten reporting states represent a statistically significant sample. Although the calculations in this report are specific to those states, they include 65 percent of the total illegal alien population in the U.S. Therefore, even if the majority of unlawfully-present foreigners in the states not covered were never arrested, the rate at which illegal aliens are incarcerated would not change appreciably. This report does not cover illegal aliens who have been convicted of federal criminal charges and are serving time in a Federal Bureau of Prisons (BOP) facility. Therefore, it does not include those illegal aliens incarcerated for committing immigration-related crimes such as illegal re-entry, welfare fraud, or identity theft. FAIR found that in all SCAAP-reporting states along the Southern Border, and in SCAAP-reporting interior states that are preferred destinations for unlawful migrants, illegal aliens are incarcerated at a much higher rate than citizens and lawfully-present aliens. SCAAP data indicate that illegal aliens are typically at least three times as likely to be incarcerated than citizens and lawfully-present aliens. Since the SCAAP program only includes those illegal aliens who have, at some point, been convicted of a crime, the only reasonable conclusion is that illegal aliens must commit crimes at a higher rate than citizens or lawfully-present aliens in order to be incarcerated at such high rates. These findings stand in stark contrast to the narrative pushed by the open-borders lobby that illegal aliens are less likely to commit crimes compared to citizens or lawfully-present aliens. In Arizona, a state where drug trafficking across the long and sparsely-protected border is widespread, nearly 3 percent of all illegal aliens end up finding themselves incarcerated in a state or local facility at some point during the year. In comparison, roughly 0.7 percent of citizens and lawfully-present immigrants in Arizona are incarcerated – meaning illegal aliens are more than 4 times as likely to be incarcerated. New Jersey is a state with relatively low incarceration rates, but illegal aliens are 5.5 times more likely than U.S. citizens or lawfully-present aliens to be incarcerated. Even in Texas – a state with an allegedly “lower” number of illegal aliens committing crimes, unlawfully-present aliens remain 60 percent more likely to be incarcerated than citizens and lawfully-present immigrants. The slightly lower incarceration rate compared to other states is likely due to the increased federal law enforcement presence at and near the state’s border with Mexico, as well as a deterrent effect that stems from Texas’ willingness to prosecute illegal aliens and turn them over to federal law enforcement. As discussed in greater detail below, in recent years, the Lone Star State has dealt with more than 273,000 crimes committed by 175,000 illegal aliens. As noted above, these alarming numbers do not include those illegal aliens currently serving sentences on federal criminal charges, as reported by the Federal Bureau of Prisons (BOP). Offenses committed by illegal aliens that may result in a federal prison sentence include crimes ranging from document fraud to alien smuggling, drug trafficking and murder. Most Americans do not wade into complex statistical data on a regular basis. But anyone who follows the evening news can see that there appears to be an unacceptably large number of illegal aliens committing serious crimes in the United States. In Tennessee, an illegal alien from Guatemala was sentenced to 50 years in prison for molesting a 6-year-old girl. Edwin Velasquez Curuchiche snuck into the girl’s home twice in 2015 and recorded himself molesting her in her sleep. Curuchiche was originally apprehended in 2013 for illegally entering the United States. Due to “catch-and-release” policies at the time, he was released and subsequently never appeared for his immigration hearing. On July 1, 2015, Jose Ines Garcia Zarate shot and killed Kate Steinle in San Francisco. Zarate had been sentenced to prison on numerous occasions prior to killing Steinle, but San Francisco’s “sanctuary city” status allowed him to be released back onto the streets despite ICE requesting that he be held until they could apprehend and ultimately deport him. In 2016 in Kansas, an illegal alien from Mexico murdered a mother and kidnapped her 6-day-old baby. Yesenia Sesmas had recently suffered from a miscarriage and faked pregnancy for the following months. Sesmas, who was living in Texas at the time, traveled to Wichita when she found out a friend she previously worked with just had a baby. She shot her friend in the head and kidnapped the child. In 2017, several MS-13 members “stabbed [a man] more than 100 times, decapitated him, and then cut out his heart” in Maryland. One of the alleged attackers, Miguel Angel Lopez-Abrego, is an illegal alien who was later caught in North Carolina. Yet another despicable act of violence occurred in Maryland as well when MS-13 members savagely beat a 15-year-old girl with a bat 28 times for “not doing a good job as an MS-13 prostitute.” Miguel Angel Ayala-Rivera allegedly ordered the beating and also made large sums of money from prostituting other underage girls. Ayala-Rivera is an illegal alien. In Iowa in August 2018, an illegal alien from Mexico was charged with killing Mollie Tibetts. She had gone missing after going for a jog the month prior in a case that also received national attention. Cristhian Bahena Rivera admitted to murdering Tibbetts after stalking her while she was jogging. The open-borders lobby maintains that sensational cases simply create a mistaken impression that illegal aliens are committing crimes at a higher rate than their lawfully-present peers or U.S. citizens. But the anecdotal evidence appears to line up with the statistical evidence provided by SCAAP. These vignettes received the most media coverage, but they represent only a small fraction of the thousands of crimes committed by illegal aliens across the United States every year. In Texas alone between June 2011 and July 2018, more than 175,000 illegal aliens were booked into state and local jails. Within this time period, they were charged with more than 273,000 criminal offenses. These crimes included 505 homicide charges, 30,408 assaults, 5,396 burglaries, 34,555 drug offenses, and 365 kidnapping charges. By simply doing the math based on this data alone, then comparing it with the number of illegal aliens residing in the state of Texas, it becomes clear that illegal aliens are incarcerated at a higher rate than U.S. citizens or lawfully-present aliens. SCAAP is governed by Section 241(i) of the Immigration and Nationality Act, 8 U.S.C. 1231(i), as amended, and Title II, Subtitle C, Section 20301, Violent Crime Control and Law Enforcement Act of 1994, Public Law 103-322. SCAAP provides federal cash assistance to states and localities that incurred correctional officer salary costs for incarcerating criminal illegal aliens. The program will reimburse state and local correctional authorities for “Verified Illegal Aliens” — foreign nationals who have been determined by ICE to be in the United States illegally. Illegal aliens for whom reimbursement is sought must have at least one felony or two misdemeanor convictions. And they must have been incarcerated for at least four consecutive days during the reporting period. These requirements mean that SCAAP reporting provides the best data currently available on illegal alien rates of incarceration because it furnishes information on individuals who are both convicted criminals and known illegal aliens. As such, more accurate conclusions can be drawn from the analysis of SCAAP data than can be drawn from other available sources of information on illegal aliens and crime. Researchers using SCAAP data need not apply subjective criteria in an effort to make educated guesses about which foreign nationals in a given sample might be illegal aliens. Similarly, researchers examining SCAAP data do not need to rely on notoriously inaccurate self-reported information about an individual’s immigration status. Those who resist the usage of SCAAP reporting as a reliable data-set on illegal aliens and crime often claim that criminal aliens are counted twice or more in a single SCAAP report. Even if this was correct (and there is no evidence to suggest it is), that assertion would be nothing other than a convenient red herring, useful for distracting the public from the truth. An illegal alien is arrested. He/she is found to have SCAAP-qualifying criminal convictions sustained in another jurisdiction. The pre-trial detention agency submits a SCAAP claim. The illegal alien sustains a new conviction in the jurisdiction where he/she is being detained and is sentenced to time in the state penitentiary. The state department of corrections files a post-trial SCAAP claim based on the new conviction. Our examination of SCAAP data, and related information, strongly suggests that there is no reason to believe this overlap results in any statistically significant repeat counting of criminal illegal aliens. The cycle time from arrest to conviction and incarceration is generally six months or longer, making it highly unlikely that many illegal aliens are counted more than once in a given SCAAP reimbursement cycle. Furthermore, it is statistically impossible that this type of reporting discrepancy could be significant enough to leave open the possibility that illegal aliens are less likely to commit crimes than citizens or lawfully-present immigrants. As previously noted, SCAAP reimbursement is provided only for those illegal aliens who have sustained “at least one felony or two misdemeanor convictions for violations of state or local law,” and who have been “incarcerated for at least 4 consecutive days during the reporting period.” Because the program covers only those illegal aliens who have had more than just a brief brush with the law, we believe that the SCAAP data provide the most accurate snapshot currently available of the rate at which illegal aliens commit crimes. To determine the total number of citizens and lawfully-present aliens who are incarcerated, we took the overall population of each referenced state and subtracted the estimated total number of illegal alien residents. We then took the number of incarcerated individuals and subtracted SCAAP-reported illegal aliens from that total. This allowed us to distinguish illegal aliens from citizens and those aliens who are lawfully present in the United States. We then determined incarceration rates by comparing the total number of illegal aliens in each state to the total reported by SCAAP as incarcerated in that state. Using population data from the Census Bureau and overall prison population data aggregated by the Prison Policy Initiative, we then performed similar calculations to determine incarceration rates for U.S. citizens and lawfully-present aliens. When making immigration policy, it is important that we be honest about the facts. In this case, the available facts appear to show that illegal aliens commit crimes at a much higher rate than the rest of the population. But, as noted above, much of the research on illegal aliens and crimes is marked by a deliberate attempt to ignore such data. Uninformed or ideologically motivated critics may look at SCAAP data and claim that it includes both aliens who have been incarcerated pre-trial and those who have been incarcerated post-trial. Such critics insist that conclusions drawn from SCAAP data will inevitably be inaccurate because some illegal aliens detained pre-trial will inevitably be released prior to the filing of any criminal charges; successfully petition for criminal charges to be dismissed; or be acquitted of the crimes for which they were arrested. However, participating jurisdictions may only submit SCAAP reimbursement requests for illegal aliens who have already been convicted of either a felony crime or multiple misdemeanor crimes. That means illegal aliens held in pre-trial detention, for whom SCAAP reimbursement is sought, were arrested with a pre-existing criminal history. Accordingly, the assertion that SCAAP data include individuals without criminal convictions is utterly false. Other critics assert that any claims that illegal aliens commit crimes at a higher rate than lawfully-present immigrants or U.S. citizens are motivated solely by racism inherent in American law enforcement. However, data on conviction rates and plea bargains generally indicate that the correlation between arrest and subsequent conviction in the United States is high. Conviction rates in state jurisdictions vary but are typically over 50 percent. For example, 84 percent in Texas, 82 percent in California and 67 percent in New York. Accordingly, courts appear to be regularly finding that police and prosecutors have sustained their burden in proving that charged illegal aliens have actually committed the crimes of which they are accused. There does not appear to be any indication that illegal alien incarceration rates are being artificially inflated by overly aggressive enforcement activity. In states with significant illegal alien populations, illegal aliens are incarcerated at a much higher rate than citizens and lawfully-present aliens. Illegal aliens commit crimes at a higher rate than U.S. citizens and lawfully-present aliens. Until lawmakers in the United States are able to review accurate, transparent data regarding the rate at which illegal aliens commit criminal offenses, they will, inevitably, continue making bad immigration policy. As a result, too many Americans will continue becoming victims of preventable crimes, and the terrible stories that occupy our news cycles all too often will remain a regular part of daily life in this country. Hopefully, this study represents a step in the right direction, and will encourage legislators, the media and academic researchers to demand better information on illegal aliens and crime. The states for which data were analyzed were chosen because: 1) They are the jurisdictions for which the most complete data are currently available; 2) based on the conclusions drawn in FAIR’s 2017 study The Fiscal Burden of Illegal Immigration on United States Taxpayers, these are among the states with the highest illegal alien populations in the United States; 3) many of the other states for which SCAAP data are available have too few illegal aliens, or too few reporting jurisdictions for reliable conclusions to be drawn.